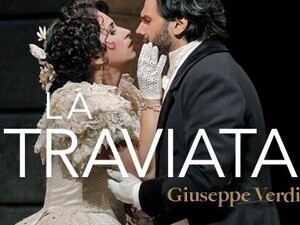 A crown jewel of grand opera, Giuseppe Verdi's La Traviata tells the story of the brilliant and beautiful Parisian courtesan Violetta Valéry as she falls deeply in love with Alfredo Germont. Haunted by her reputation and illness, Violetta navigates sexual politics and confronts societal expectations as she braves the most broken of hearts. Classic sets and costumes honor tradition on the grandest scale. Romanian soprano Aurelia Florian, whose performance of Violetta at the San Francisco Opera was called “incandescent” by the San Francisco Chronicle, makes her Portland Opera debut as the tour de force heroine. Tenor Jonathan Boyd returns to Portland Opera as Alfredo. Approximately three hours, including two intermissions.